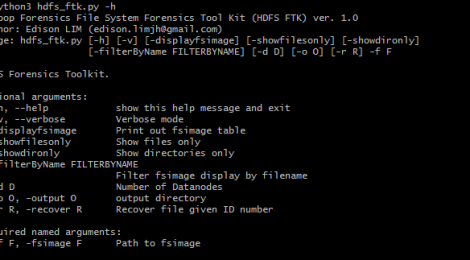 Browse: Home / Hadoop File System Forensics Toolkit (HDFS FTK). 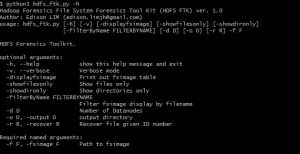 Hadoop File System Forensics Toolkit (HDFS FTK). View and extract files from an offline image of Hadoop file system. Hadoop File Systems is one of the most widely used distributed file systems in the world. However, forensic techniques to analyze and audit the systems remain limited. In HDFS, metadata is separated from the actual data blocks. The namenode contains metadata (file name, timestamps, permissions); while actual data is stored in the datanodes in blocks. Although HDFS has command client tools to manage the extraction files, it only works with a running cluster of HDFS machines. This tool aims to provide investigators with the ability to perform forensics analysis on offline evidence captures of Hadoop File System images. * SCP files to a local forensic workstation and untar the datanodes’ data directory. ← Whapa is an android whatsapp database parser that automates the process.